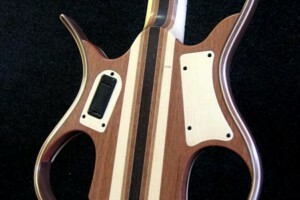 Luthier Paul Lairat will be debuting a new model at the NAMM Show, named the Sirya. The radically designed body incorporates five types of wood, as the sides are made of walnut, mahogany, maple and ebony while the body itself can be either wenge, maple and mahogany or maple, walnut and mahogany. The laminate neck then contains four types of wood with six layers of maple, two layers of mahogany, two layers of walnut, and a layer of wenge. 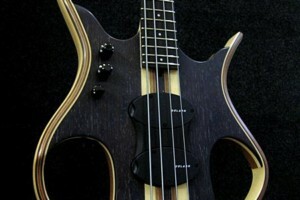 The fretboard is also wenge or maple with 24 frets. For electronics, the Sirya employs a pair of Delano’s Xtender pickups coupled with a John East preamp. The control knobs are mounted near the upper horn for better access. Hardware includes Gotoh tuners and an ABM bridge. The Lairat Sirya is customizable and comes in 4-, 5-, and 6-string models, with fretless or left-handed options, as well as the choice of different colors and woods. 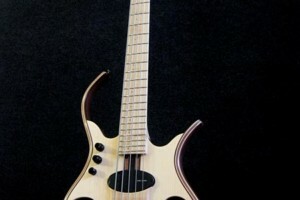 The 4-string version has a base price of €4,200 (approx. $5,359 USD). For more info, visit the Lairat website. You mean that this ugly beast is $5000? It’s not even a complete bass! It’s a…bass full of holes and over priced. I couldn’t agree more mate! Looks good, but take it on the road and it will be broken in a week. And it probably doesn’t sound too great, since it has very little wood to resonate. Also, the bridge looks really cheap. ‘Sto tizio tra l’altro in miniatura sembra Zucconi. 100% pickup sound, no wood, nope, this bas isn’t for me. Both of these players play the Stega which according to Paul sounds the same as the Syria. 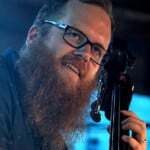 Also, both of these bassists use this bass as their main touring instrument.